Is there any 3D shoots near San Antonio that happen monthly? 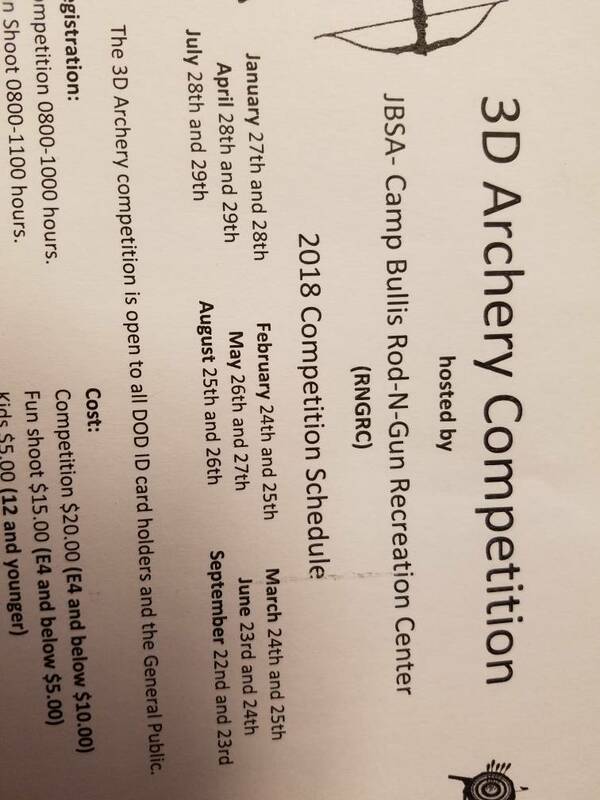 Archershavenfieldarchery.com <- I'm hoping to join their group next month and start checking them out, looks like they are up around Canyon Lake. Camp Bullis has a monthly 3D shoot. Any dates for camp bullis? Called Camp Bullis and was told the 24th and 25th for March 3D shoot. Originally Posted by Adam G.
Do you have to be active or retired military to do this shoot? I know since 9/11 they are very strict about base access (used to fish at Fr. Sam a heck of a lot). No you don't have to be retired or active but they say to call the rod and gun club before going. For what reason I don't know but I know they get some info from you. I'm sure if you call them they can help you out. Anyone going to shoot this weekend at Bullis? Archers Haven will be hosting IBO style shoots on the 3rd weekend of every month. My wife and I will try and make it out. Is it by chance good enough terrain to take our jogging stroller (has big wheels) so that our 2 boys can tag along? We are able to use it when we shoot at Camp Bullis. I'd say the terrain can be slightly challenging depending on which wheels you have on the stroller. Come check us out it will be a great time. Anyone still in the SA area still active? There's several people here actively shooting, Camp Bullis, and Archer's Haven were mentioned. Buck and Does and the Mission Ridge Range offers some league shoots, there is also Bear Country Archery in La Vernia that does practices on Sundays, hope that gives you some options to look into. Do you have a link to that shoot as well? Fredericksburg Archery Club has a FB page, and I think they have a website. Their monthly shoots are held on different local ranches, if I remember correctly. Here is schedule for Camp Bullis if anyone is interested. I shot it this past Sunday and was fun. Longest shot was maybe 35-37yards. And that was from furthest stake. 30 targets and 2 per station. Thanks for posting, I hope to make it out there on the next shoot.